Como clientes, empresarios y seres humanos queremos que las empresas y las marcas que nos rodean sean relevantes. Queremos, a pesar de diferencias en hábitos, personalidades únicas, gustos y disgustos, que un servicio o producto resuelva un problema y trae beneficios tangibles o intangibles para nuestras vidas y las vidas de los demás. La Comunicación Estratégica, que se entiende como la comunicación corporativa provista de un enfoque estratégico, nos puede ayudar en este objetivo de crear y desarrollar empresas y marcas relevantes. Cuando uno habla de la Comunicación Estratégica es normalmente cuando una organización está fijándose una meta concreta: la de ganar participación de mercado, resolver un tema de relaciones públicas, o manejar una situación difícil con sus accionistas. Aunque se la puede implementar con mucho éxito en momentos decisivos como aquellos mencionados, cuando se la integra totalmente en una organización, contando con el apoyo de gerencia y de los directores de la empresa, la comunicación estratégica puede ser el factor clave para que la empresa no solo alcance exitosamente sus metas comunicacionales sino que también sirva para informar la estrategia de negocios de la empresa y la ayude a aprovechar la información que la distinga favorablemente por encima de sus competidores. En unas palabras: siendo más relevante. 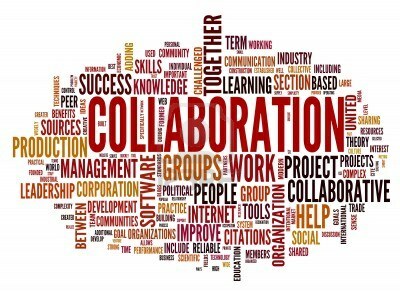 Collaboration – whether on a project, a campaign, a strategy, a new product/service – helps you to create more relevant products or services for your target market. And don’t we all strive to be relevant? Collaborating with your market (called collaborative marketing) is a way that you create things that have heart and meaning for your clients. Why? People who help create things are more likely to buy and support those same things. It makes sense. Look and listen to what your customers and saying and doing. Do an “audit” of what is being discussed both online and offline. What trends do you see? This is a fancy word for finding your customers and encouraging them to act as both buyers and marketers. Word of mouth marketing is one of the oldest forms of advertising and still one of the most important (in some instances the most important). I also like the term “grassroots marketing” – marketing from the ground up. Engage your customers and find ways to bridge the gap between your business practices and their needs (see #4). Consistency is a key factor to effectively getting your message across and building rapport with your customers. Optimize what you can in order to bridge any gaps that might exist (see #2). Commit resources to collaboration and to the continuous process I have just described. Convincing someone of your ideas is an art and a science and is one of the easiest and hardest things to do. Here’s why: a) it depends on your audience b) it depends on you and c) it depends on your idea. All these things come into play in the sale of your “business idea”, the elevator pitch, the “convince me why I want to do business with you” speech…success depends on how well you are able to control the above three elements. Pitching is Art because the pitch should be effortless; telling your story in such a way as to attract the attention of your audience, to show them a new world while doing justice to you and your idea. Pitching is Science because there is a science to it; we know how the brain works, how it reacts to different stimuli and how it processes “threats”; so even if your idea will make (or save) your client millions of dollars, there is always the feeling that a new idea is a threat to your client’s status quo. How important is it that your client hears what you are saying? What about your spouse, your son or your daughter? What about your community? I think you will agree that communications is very important; not only the technical stuff – “press this button to complete transaction” or “clean your room now” or “we were able to grow our market share by 10% in the last quarter” – but also the soft stuff. Telling people what they mean to you (yes, even your clients!) and listening to their opinion of you and your work can be more revealing than facts and figures. Why? Because they help you pinpoint values. Yes, that’s right, values. Hearing what others think of you and what you do can help you understand what they find valuable or desirable about you. It may be different from what you think. It may be exactly what you planned, imagined or even hoped for. I am not suggesting that we should live our lives and lead our businesses based on what others think of us but rather that communications (sitting down with your employee for lunch, talking to your client how their business is doing, or reading to your child at night) can help forge connections that can become very valuable. If you want more “a-ha” moments (sometimes called “lightbulb” moments) then it starts with making unexpected connections between things. If we connect more often with people around us we may very well have more “a-ha” moments and don’t we all want more of those? And, on the flip side, don’t we all want our voices heard? Yes, grab the play-dough… This post is about the importance of having fun. Why should you do something (including your work), if you are not having fun? I realize that work might not be fun all the time – that would be a little exhausting in my opinion – but when your professional life is a reflection of your passion and your talents then you will have fun and you will feel like you are living your life and not simply spending it. If you read the “making ideas work” label on this blog you will understand why I love business strategy. Business strategy has always been a part of my life – my family and life experiences instilled in me the importance of doing work that I believe in and that ideas – whether attributed to my personal or professional lives (or both) – are not things to be scared of; they are things to be cherished and pursued and then changed or adopted. Sometimes ideas work out and sometimes they don’t but they are the essence of business and if we have fun with them, they can lead us to take advantage of tremendous opportunities for personal and professional growth. Business more than any other occupation is a continual dealing with the future; it is a continual calculation, an instinctive exercise in foresight.